Nationally, Democrats are at a disadvantage. Democrats currently hold 46 seats, and there are two Independent senators that often vote with the Democratic Party. In order to obtain a simple majority, they need to pick up at least three more seats than they currently possess. Normally, that wouldn’t be a problem, but the 2018 map makes Democratic expansion unlikely. 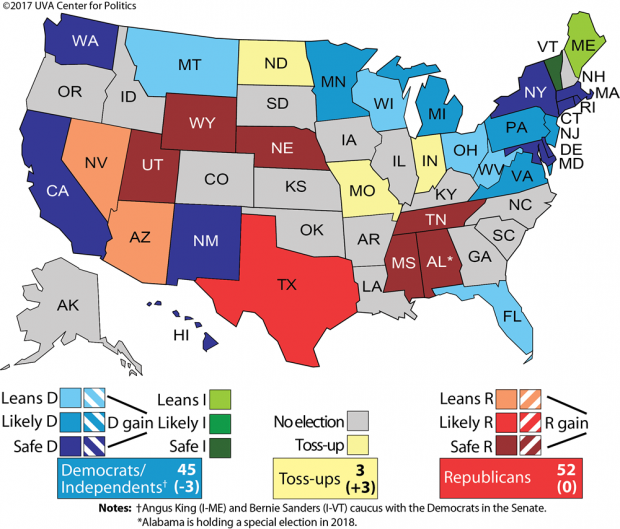 There are three seats rated as “toss-ups” by the University of Virginia’s Center for Politics, and they are all currently held by Democrats. O’Rourke has a solid resume, serving on the El Paso City Council for six years, and as U.S. representative since 2013. Although he’s been elected to federal office twice, his campaign experience is still largely untested. O’Rourke was able to defeat the Democratic incumbent, winning a 5-way primary by 6 percentage points in 2012, before going on to defeat Republicans with 65 percent in 2012, and 67 percent in 2014. O’Rourke was essentially unopposed in 2016. No Republican ran in the race, but he only managed to earn 85 percent of the vote. O’Rourke’s fundraising chops are also up for debate. He was able to win the 2014 race with only $505,000 in contributions, significantly lower than the $1.2 million average fundraising from a winning congressional candidate in 2014. It’s unclear if that lower number is from a lack of fundraising abilities, or if it’s a result of a relatively safe Democratic race. O’Rourke acknowledged he’s largely untested, but offered his narrow win over Democratic incumbent Silvestre Reyes in 2012 as proof of his campaigning abilities. Cruz’ political career began in 2012 as well, but the conservative firebrand has managed to make a name for himself as a national force and fundraising savant in the years since. He won the state in 2012 with 56 percent of the vote, after defeating the GOP incumbent in the run-off primary election. Cruz was able to rake in $14,511,279 in the race, and was one of the best-financed presidential candidates, and was one of three that survived the 2016 primary all the way to the Republican National Convention. Perhaps the most revealing metric between the two is that despite O’Rourke’s small campaign spending numbers, he had a much higher dollar spent per vote than Cruz. O’Rourke’s campaign spent $6.10 per vote in 2012, and $8.30 per vote in 2014. Cruz only spent $3.16 per vote in the 2012 race. Republicans remain highly skeptical that Democrats will be able to win in 2018, comparing O’Rourke’s chances to that of Texas gubernatorial candidate Wendy Davis, who lost in a blowout election.